We had a really fantastic day exploring RHS Wisley today. We have been to Wisley a few times before and hold membership but we have tended to stick around the main garden part and the glasshouse. Today as the gardens were very busy we ventured further and discovered so much more! We arrived at lunch time and enjoyed our picnic on one of the lawns before walking towards the lake. 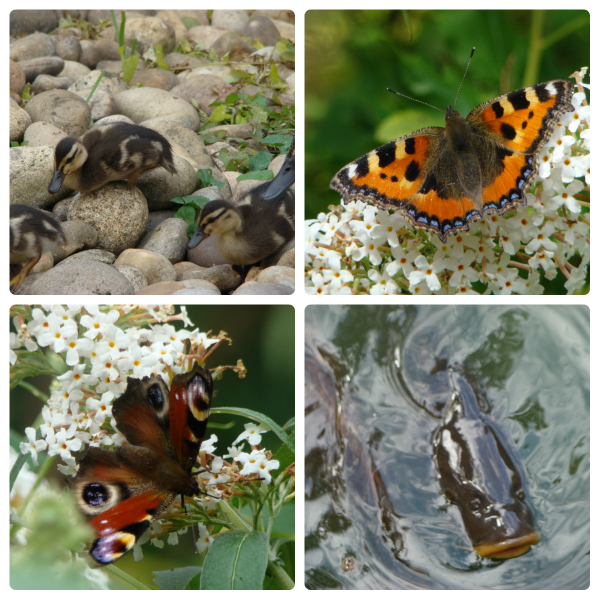 We saw some very cute ducklings and some huge fish! Just past the lake we stopped by a Buddleia so I could take some photographs while Gordon and the kids had a few wheelbarrow races and played Hide and Seek. After I had secured several butterfly shots and the kids had exhausted all the hiding places they could find we carried on walking and followed the signs towards the bird hide and Pinetum. 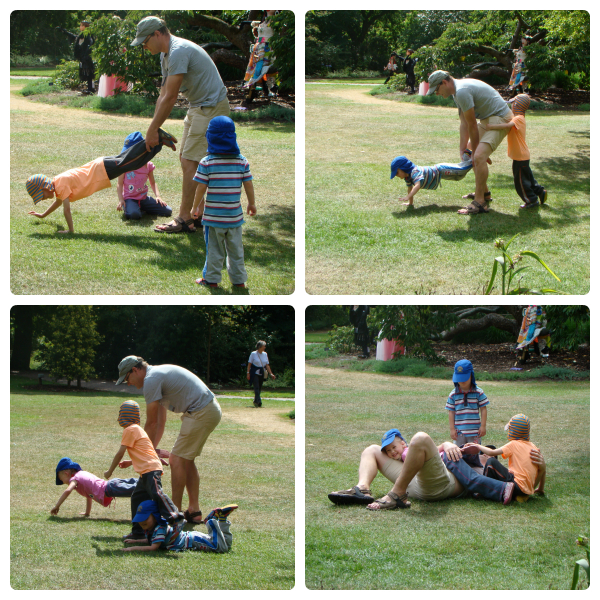 We have not been to this part of the gardens before so there was lots for the kids to explore. We found pine cones of all shapes and sizes and some interesting trees to play under. 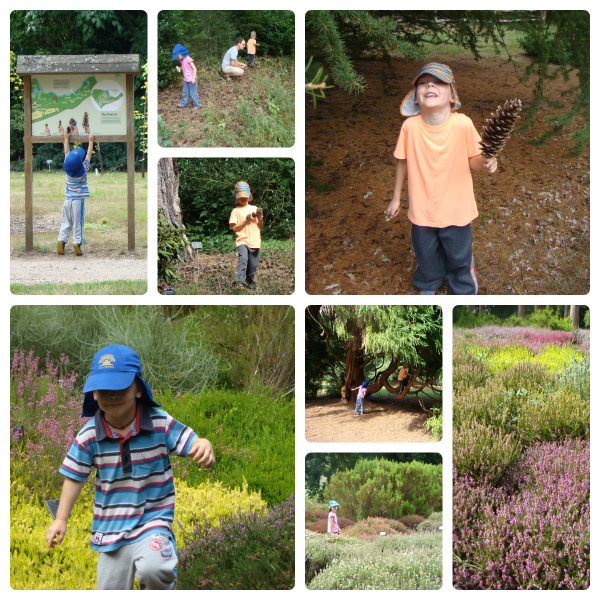 At the end of the Pinetum we found the Heather gardens, which we beautiful and full of bees and butterflies. The beds were arranged with small paths between them and the kids loved running through these “mazes” and finding different ways in and out. After running through the Heather we reached the bird hide (but didn’t see any birds) and explored the bug garden. 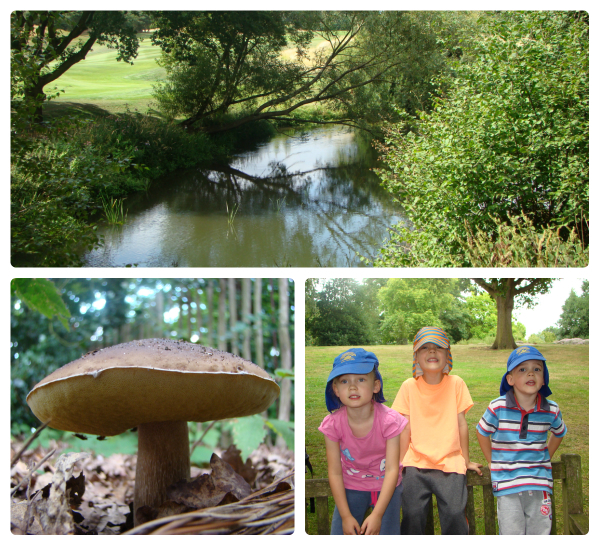 We saw more bees and butterflies before starting the walk back to the cafe as we were all in need of ice cream! On the way back we walked next to the river. We spotted a rabbit hole, collected yet more pine cones, found some bird feathers we need to identify tomorrow, ate blackberries and saw some impressive mushrooms. By the time we reached the cafe we were all quite worn out! But ice cream gave the kids a bit more energy and so the final place we went today was the play area, where they climbed, balanced and scrambled while Gordon and I sat down for a bit! We had a lovely day at Wisley today. Every time we go I am reminded what a beautiful place it is with so much to do for everyone. We’ll definitely be going back soon. Did you make the collages of photos before uploading them or is that a WordPress feature? If you don’t mind me asking. It looks really good. Thank you, we did have a great day! Thank you 🙂 Think I will give it a try as they look really great. What a great family day out – full of fun, games and plenty of adventure. The photos of the wildlife are great and so are the ones with the children and their Dad. Thanks for linking up and sharing your outdoor fun with Country Kids. its amazing how often you can go to a place but find something new and different there. Looks like great fun. love the wheelbarrows, long while since we have done that. Nature at its finest with all that you found. I know.. we can’t wait to go again and discover more! I was impressed all the kids could manage the wheelbarrows, even the 3 year old! They loved it!